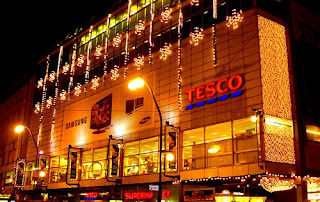 My Scottish boyfriend likes to mock my love and adoration of Tesco; he just doesn't understand how I could be so excited by a big grocery store. I've written about my obsession with Tesco before and I have to admit that my obsession has been further fuelled by two events: 1. Paul's recent acquisition of a 14-year old BMW and 2. the recent opening of the HUGE open 24 hours Tesco at Silverburn. "People who are against Tesco are the sort of people who 50 years ago would have been against labour-saving devices on the grounds that they might conceivably give women time to put their feet up, have a cup of tea and watch daytime telly for half an hour." I love Tesco too. Those great black reusable grocery bags are brilliant! I guess we will have to come back to Scotland to see the new 24 hour Tesco. Maybe Paul will take us in that 14 year old BMW. Sounds hot.